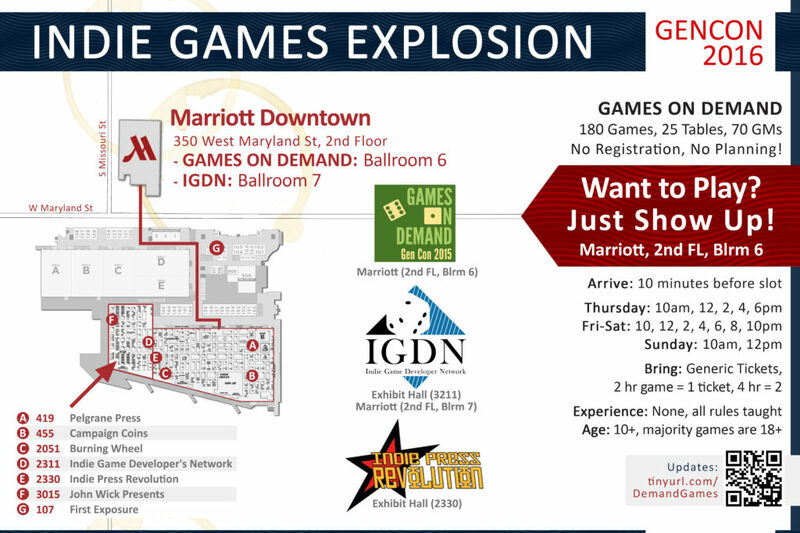 The 2017 Gen Con Games on Demand starts this week! We hope we’ll see you there, in our space at the Hyatt Regency hotel, second floor, ballroom A/B. Use the following map to find your way, and feel free to download and print copies to hand out to your friends! If you’d like to know what games we’ll be offering, feel free to check out our 2-hour, 4-hour, and larp menus. Please note that these PDF files are pretty large! 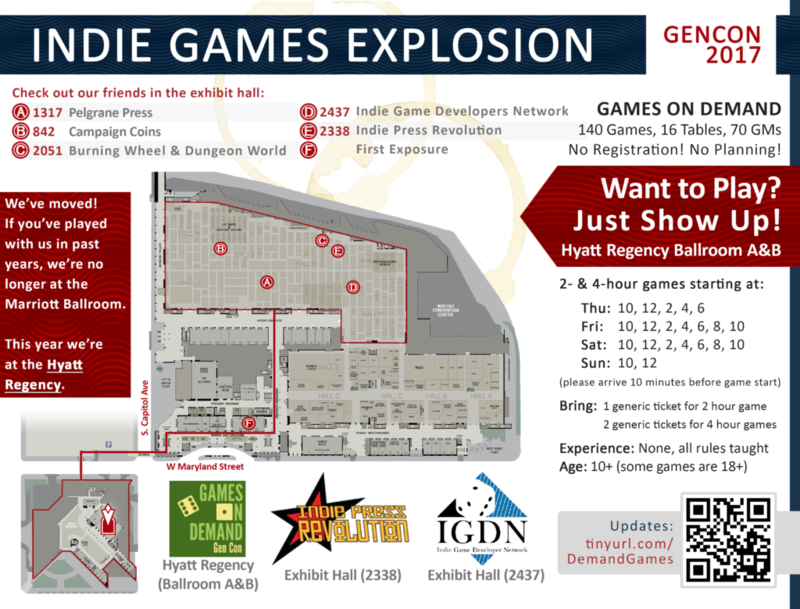 Year after year, Games on Demand has been bringing you the best in indie games at various conventions. The event is entirely non-profit and run by volunteers, with funding from donations to cover expenses. 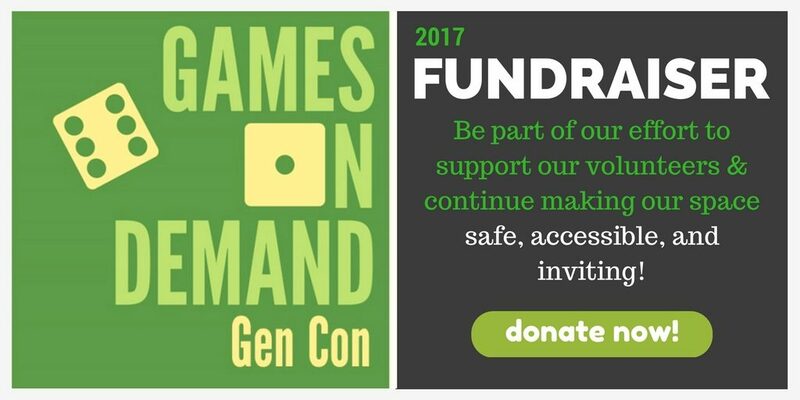 This year, we’re stepping up from our usual requests and using a GoFundMe campaign to ask for your help to make Games on Demand happen at Gen Con. 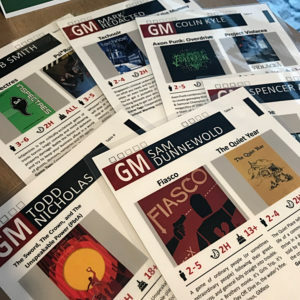 Signage and printing costs: we need to print signs and the “menus” for the games our GMs offer. Volunteer support: our volunteers put lots of their valuable convention time into bringing you Games on Demand. In return, we like to show our appreciation for their efforts by providing materials, games, and refreshments whenever we can. Badge ribbons: we intend to make available “Games on Demand” and “Games on Demand GM” ribbons. We also want to provide “my pronouns are” ribbons in four varieties: “she/her”, “he/him”, “they/their” and fill-in-the-blank. These will be available for anyone participating in the event. As of the start of this campaign Gen Con is just a few weeks away, so we need these funds soon! If you can, please throw a few bucks our way so we can make sure this year is the best year yet for Games on Demand! 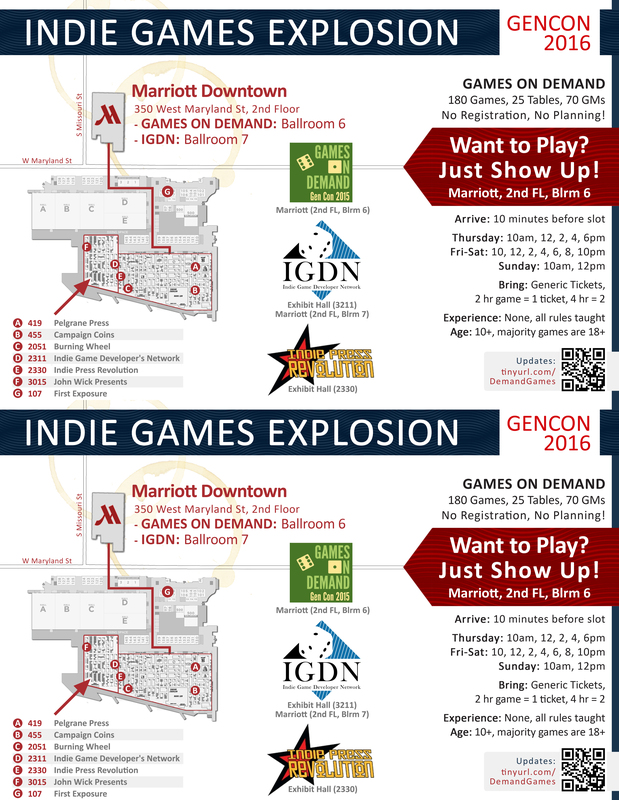 On behalf of all the organizers of Games on Demand Gen Con 2017, thank you!